A Russian bishop, who had travelled to the West for the first time after the fall of Communism, was asked the following question by western Christians (Protestants and Roman Catholics): “What is the Russian Orthodox Church doing to address social issues?” The bishop humbly replied: “We serve the Holy Liturgy.” Surprised by this answer, they did not understand the bishop. 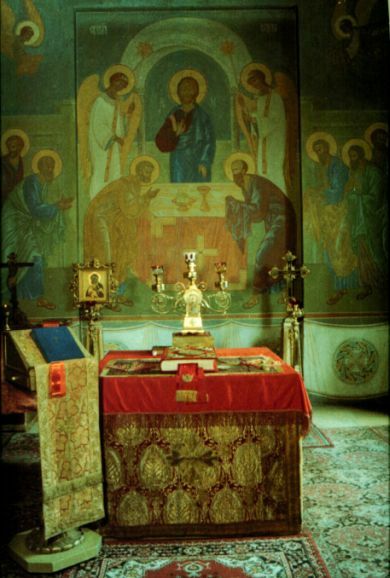 With regard to the divine Eucharist, it should first of all be explained that for us Slavs it is the Liturgy. In Greek the word “liturgy” has several meanings: service, function, work. That is, for the Greeks the word “liturgy” refers not only to the divine service, but also to an executive function or activity, such as that of a governmental organism. The word is not used within a narrowly defined sphere, such as that of the church services, but within any sphere of activity. Therefore, when referring to the Church’s mystagogical service, the Greeks use the phrase “Holy Eucharist,” which means what we call the Liturgy. The use of the term “Eucharist” distinguishes this divine service. Therefore, regardless of the fact that our people are accustomed to the word “liturgy,” in terms of significance and meaning Eucharist and Liturgy are synonymous. Eucharist comes from the word “thanksgiving” and reflects the first main element of the canon of the Liturgy, that is, the Anaphora, which begins with thanksgiving to God. The Lord Jesus Christ is the first genuine thanksgiving to God, inasmuch as He, in the name of all creation and of man, as the crown of the creation of the world, thanked God the Father. Such thanksgiving was also expected from the first-created man, Adam. If he had fulfilled the law of thanksgiving, he would never have sinned. Thine own of Thine own, we offer unto Thee, on behalf of all and for all. We read this in the prayer of the Eucharistic canon, as a sign of thanksgiving for what the Lord has done, is doing, and will do for us. The Holy Liturgy is, above all, a mystery. However, it is not a mystery in the sense of being secret or mysterious. It is a great and salvation-bearing event. It is a mystical and profound event that is not exhausted by its visible phenomenology. At the same time, it should be noted that this phenomenology is not a ceremony. Today many think that this Divine Mystery can simply be played like a theatrical performance. Notwithstanding, this event is mystical, possessing inscrutable and unfathomable depths. Therefore, it is best to say that the Eucharist is a mysteriological event that is salvific and that applies and realizes the work of our Lord Jesus Christ to us. The Holy Liturgy is, in the words of St. Irenaeus, the “pragmatia of Christ,” in the sense of being a creation or production, as well as its result and carrying out; that is, it is an activity that is both the work of God and simultaneously the fulfillment of the work God desired to perform for us. Uniting human nature to Himself, He is the Gift that we offer at the Liturgy. Therefore, the Lord is both the Lamb and the eternal Hierarch or High Priest, both offering Himself and accepting this sacrifice with the Father. This is the only miracle; this is the mystery of Christ, as the Apostle Paul calls it. This mystery is concentrated, manifested, and realized in the Holy Eucharist. This is shown best of all by the Apostle Paul in the tenth chapter of his epistle to the Corinthian Church: The cup of blessing which we bless, is it not the communion of the blood of Christ? The bread which we break, is it not the communion of the body of Christ? For we being many are one bread, and one body: for we are all partakers of that one bread (1 Corinthians 10:16-17). This is realism, authentic Orthodox realism; this is the pragmatic teaching of St. Ignatius. For a clear and correct understanding of the meaning and significance of the Liturgy, it is necessary first to highlight a few important points. 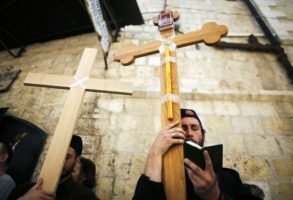 Symbolism in Orthodoxy has been a very topical phenomenon throughout its centuries-long history. Therefore, a symbolic understanding and interpretation of the Liturgy has been widespread. However, the symbolic principles used in the interpretation of the divine services have not always remained within acceptable boundaries. Symbolism has quite often contributed to the loss of the true meaning of the divine services. The various names, descriptions, and interpretations of the Liturgy – such as symbol, icon, and sacred rite – are only auxiliary means, just like those that exist for articulating other Holy Mysteries. In particular, it is well known that the Church is perceived and understood as a body. However, the Church is not just a body, but something more than a body; it is the unity of believers in which Christ is the heart and the head, with the Holy Spirit as its soul (inasmuch as He is the animating principle, action, and Giver of Life). Likewise, the Liturgy is not just a symbol or icon, but something much deeper and loftier than merely a symbol. All this symbolism exists only in order to express and describe individual elements of church life, the meaning and significance of which can never be fully defined. The application of any definition, word, or sign is restricting, inasmuch as the Liturgy is not subject to any limitation; that is, its meaning and understanding cannot be expressed by a symbol or definition. In the text of the Eucharistic prayers we read: “filling all things and inexpressible.” That is, not only can the Eucharist not be described, it cannot even be uttered, for it is unlimited, unattainable, and boundless. And this is precisely how it is represented to us as a Holy Mystery. The Liturgy, moreover, is not just one of a number of the Church’s Mysteries. Baptism is one of the most important Mysteries; it is the Mystery of existence by which, in the words of Nicholas Cabasilas, we become of Christ; or, to put it better, after Baptism we already belong to Christ. In the Mystery of Unction we acquire the life-giving gifts of the Holy Spirit. However, the spiritual food that we eat, the Eucharist, is a synthesis of all the other Holy Mysteries. This is precisely the same attitude that should exist towards the Church’s other sacred rites. For example, the funeral service should be performed with the Liturgy; that is, it should “see off” the reposed person. 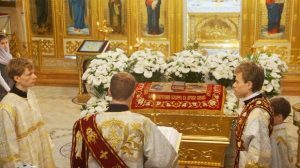 Not as it is done in contemporary practice: first the Liturgy, and then the funeral. We should see off the reposed to the Heavenly Kingdom with the Liturgy, for in the prayers we express the wish that they be with God. If the Holy Eucharist is a reflection of the Heavenly Kingdom, the point at which eternal life begins, then the funeral rite should stand in close relation to the Liturgy. Following from this, it should be said that the Eucharist is the shared and uniting reality for the entire Church. When the Liturgy is called an icon, this indicates that it is not yet the fullness of the Heavenly Kingdom, as the presence of a complete reality. It becomes analogous to an icon, that is, to an icon leading us to the Heavenly Kingdom. Therefore the Eucharist, as icon, has an analogical-mysteriological character. Christ Himself did not say: “Take, this is an icon of My Body”; rather, He said: “Take, this is My Body and this is My Blood.” Therefore, in contrast to the iconoclastic conception of the meaning of the Liturgy as icon, in Orthodoxy it has the opposite meaning. By no means does it lose the iconicity and analogicity that lead us to fullness. The Greek word “typos” is very similar to icon: it is a model or imprint. Therefore, in the Eucharistic prayers we ask that we would more genuinely and fully commune with Him in the Heavenly Kingdom. This is the truth, reality, and fullness to which we aspire, as the Apostle Paul says: For now we see through a glass, darkly [1 Corinthians 13:12]. However, this does not discount the real existence of that which we receive in the Mystery of the Holy Eucharist, but simply lifts us to a higher fullness. It is only in this sense that the Liturgy can be said to be an icon. A similar situation took place with the term “consubstantial.” It had one meaning in the teachings of Paul of Samosata, and another in the decrees of the Council of Nicaea, that is, in the Nicene Creed. It is within this context that one can examine the understanding of the word “symbol.” In Christianity it has a much more profound meaning than in the Old Testament or in the philosophy of Plato. The word itself derives from a Greek verb that indicates the co-presence of one thing in another. Such an understanding of symbols is expressed very clearly in the works of Dionysius the Areopagite. It is this mystical, analogical, and mysteriological meaning and interpretation of symbolism that is acceptable for the Orthodox. The Church, as the Body of Christ, is present in the Holy Eucharist. The body is present in its members, as St. Nilus Cabasilas puts it beautifully: “The entire vine is fed from the roots.” Therefore, in the Mystery of Communion we receive the Body of Christ, which gathers and unites everyone who receives Communion. We are seeking to draw salvation from this life-giving Source. It is not we who turn Him into our body, but He Who turns us into His Body. When we receive the Divine Gifts, the Lord includes us into the Body of Christ; it is not we who include Him as an integral part of our bodies. In speaking of the Mystery of the Eucharist, I would also like to draw attention to a few questions of contemporary liturgical practice. Many even today, after Christianity’s two thousand years of existence, still do not have a clear understanding of Communion. For the reception of the Eucharist it is very important to prepare worthily. Given the importance of the Liturgy, one must worthily prepare oneself by fasting, prayer, and ascetic struggle. But a much deeper meaning lies in the fact that Communion is not simply the reception of the Sacred into oneself: it is an event thanks to which one is included into the unity of the Body of Christ. According to the canons of the Orthodox Church, whoever does not receive Communion for two or three weeks is subject to penance and ecclesiastical discipline. Unfortunately, many today do not understand this. The meaning of the Liturgy has acquired a sense widespread in the Roman Catholic Church. Therefore, one very often hears questions such as: How many times should one receive Communion? How many days does one need to fast? How does one need to prepare? It is as if the importance lay in quantity. Of course, this does not mean that one does not need to prepare worthily for the Liturgy. As I have already remarked, this profound mystery, which opens to us the doors of the Heavenly Kingdom, requires conscientious and worthy preparation. But who is worthy? Who can in fact say that he worthily dares to approach the Savior’s Body and Blood? Therefore, in the prayers before Holy Communion we read: “grant me to receive communion of Thy holy things without condemnation… neither to my judgment, nor to my condemnation.” How can a priest say that he is worthy and that we are unworthy? A priest, as a bearer of the mystery of the priesthood, undoubtedly has the grace and energy of God given by the Holy Spirit for the performance of sacred actions; but this does not prevent him from sinning, inasmuch as he has also been given the free will ­– that is, freedom of reason – that grants him the ability to choose between right and wrong actions. Gregory the Theologian said that he offers himself, too, as a sacrifice. He who liturgizes is the sacrifice that is being offered and its result; that is, he thereby consecrates himself as well. He is fully included in this event, and through him God the Holy Spirit acts in man. From this it becomes clear that the division between laity and clergy in the Mystery of the Eucharist is incorrect. The Holy Eucharist is wholeness, catholicity, and universality. 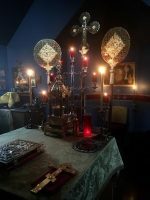 Khomiakov said: “Whoever knows the Liturgy knows what the Church is.” It is not simply one of the Mysteries or one step towards the Heavenly Kingdom; it is a conciliar act, at the head of which are the bishops, which has been passed down over many centuries of history and been preserved in our own day. The appearance of parishes at the end of the third century was accompanied by the establishment of very close ties with episcopal administration. The bishop, standing at the head of the parish or community and performing the Liturgy, played and continues to play an important role. If a priest were to serve the Liturgy without commemorating the bishop, then regardless of whether all appearances were carried out and all the prayers pronounced, it would not be the Liturgy. The Holy Eucharist includes ecclesiological dimensions, and therefore only the Church has the right to celebrate the Holy Eucharist. One of the most important names of the Liturgy, one that allows for a correct understanding of its meaning as a life-giving Mystery, is participation. Christ is present by the Holy Spirit; and the very action, participation, and pragmatia is the Eucharist. All creation participates therein. The Eucharist is expressed primarily as an act in which the whole people of God participate. Christ is a member of this people: as deacon, priest, and bishop; as foundation and head of the Church; and as leader of our salvation. Therefore, the Christological mystery of the Church is identified with the mystery of the Liturgy; the Liturgy is the identity of the Church. A Russian bishop, who had travelled to the West for the first time after the fall of Communism, was asked the following question by western Christians (Protestants and Roman Catholics): “What is the Russian Orthodox Church doing to address social issues?” The bishop humbly replied: “We serve the Holy Liturgy.” Surprised by this answer, they did not understand the bishop. 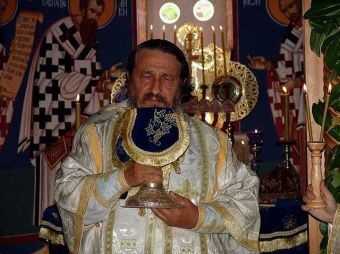 They did not understand for one simple reason: they do not understand the Church and do not know what it means to serve the Divine Liturgy. This was the best possible answer, inasmuch as the Liturgy is the entrance to the Heavenly Kingdom, the entrance to the eternal reality that has no need whatsoever for social services. The Heavenly Kingdom will be like an eternal meal consisting not only of thanksgiving to God, but also of the active deeds of all: of praxis, movement, and participation. The fact that today choirs exclude the possibility for laypeople to participate actively in the divine services is also bad. That which is basic and, in fact, already belongs to them, should be returned to the people: “Amen,” “Lord, have mercy,” “To Thee, O Lord,” “And with thy spirit.” In ancient liturgical texts we have instructions for what was to be executed by the people, the choir, and the readers. The Lord Himself expects us to participate actively in the Eucharist. These words were spoken by Epiphanius, deacon and legate of Archbishop Thomas of Sardinia, at the Council’s sixth session. This passage was rendered by the Rev. John Mendham in his 1850 translation of the full acts of the Council as follows: “For none of those trumpets of the Spirit, the holy Apostles – none of our venerable Fathers ever styled the unbloody sacrifice made in remembrance of the passion of our God, and of His whole dispensation, ‘the image of His body’; for they have not received of the Lord to speak or confess in this manner” (p. 355). The Revd. Mendham adds this passage from the Rev. Henry Stebbing’s 1834 History of the Christian Church in a footnote: “on arriving at that article in the definition which stated that no other image of Christ was to be acknowledged but that which He had left of Himself in the eucharist, the whole assembly expressed its horror in murmurs of execration; and the doctrine of the real presence being proclaimed it was triumphantly asked, ‘How there should be an image of Christ in that which was Christ Himself?’” (Ibid., 344-345).